I don’t know about you, but only having a strap to hold onto that can swing around in front of the barrel while shooting makes me nervous. It’s not uncommon to find M-11s with bullet holes in the strap from it swinging out in front of the gun while shooting. There are even a few cases of people shooting themselves in the hand because they used the factory strap to hold onto the gun. 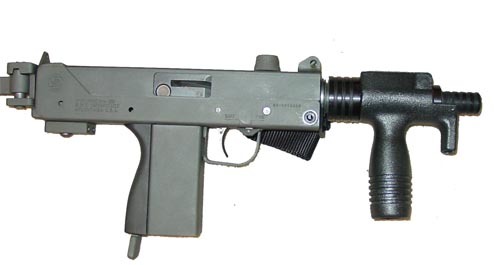 So when I got my M-11/NINE, I went searching for a decently priced front grip that was comfortable. I had tried a “K” grip on a friend’s M-11/NINE and liked it enough to get one for myself. I found one on FTF’s site that looked nice so I ordered it. I am not sure who made it because there was no manufacture marking on it. The shipping box was unremarkable from the outside, which is a good thing since you don’t want post office employees with sticky hands to get some thing for free. The package was packed with shipping papers and old catalog pieces that seem to have provided sufficient protection. The “K” grip came with a Allen wrench to adjust the “K” grip's position on the barrel. 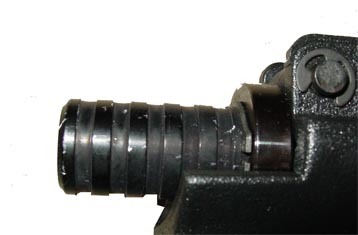 The “K” grip easily installs onto the threaded front portion of the M-11/NINE’s barrel. Unfortunately it can easily unscrew also. This is a problem related to thread type and size used on the M-11/NINE’s stock barrel and not the product it self. The finish that they used on the metal parts seems cheap and comes off with the slightest scrape. The plastic seems to be of decent quality and is sturdy enough that normal use won’t break it. Just don’t over tighten it or smash it with a hammer. The grip won’t win any beauty contest but that’s not the reason I purchased it. When shooting with the “K” grip I noticed it improves controllability tenfold over what the factory strap provides. 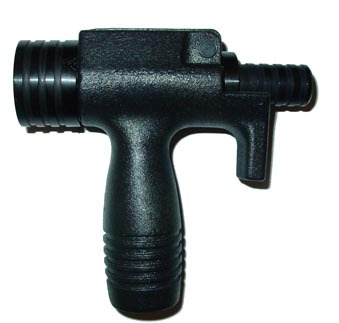 The grip even has a little notch in front of the grip to prevent the shooter from moving fingers out in front of the barrel. Some things I disliked about the grip while shooting was that your hand can come into contact with the metal portion that threads onto barrel. This can get very hot after a magazine or two and I have burned myself a time or two. A solution to this problem may be to cover the area with a nomex sleeve of some sort. Another thing I disliked about the grip was that it can unscrew easily. This isn’t the grips fault though; it’s a fault of the M-11/NINE’s factory thread size. Overall the FTF “K” grip is a decent alternative to the factory front strap. It won’t win any beauty or quality contest, but it serves its purpose as a functional grip well. Approx $50.00 US Is an alternative to the unsafe factory strap.